Blair: Excuse me. Why aren't you at MOMA meeting me? Dan: I decided to grab lunch with my dad instead. Why aren't you at MOMA meeting me? Blair: I'm standing you up. Dan: Ah. Well apparently great minds think alike. Blair: But I had good reason. Blair: You were right. This is a much better idea than spending the day pretending to like some German pedagogue of art. I'm going to shop until you drop. Dorota: This could happen at any time. Ben: So if you haven't already guessed, Serena and I are more than just friends. Cynthia: You think I don't know? Why'd you think I came to New York? Ben: How'd you figure it out? Dorota: Your new secrecy, calmness with Mr. Chuck, supporting Miss Serena's new boyfriend. And last week I find NOVA documentary in your Netflix queue! Dorota: Don't want to make you late to.... What exhibit is it again? Dorota: Maybe I could go with you. Blair: You don't even know who he is! Dorota: He created term "social sculpture" to illustrate idea of art's potential to transform society. Blair: How do you know that? Dorota: From Mr. Humphrey's New York magazine I found in your room! Blair: Just what are you implying? 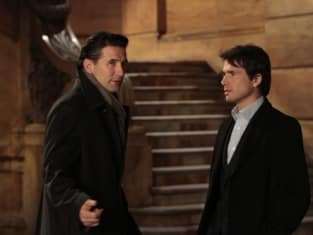 Rufus: Well for what it's worth, when Lily and I started hanging out again, neither of us wanted anyone else to know. But friendship can be an excuseâ€”a cover when there's something more you don't want to admit, or you're too scared to explore. Dan: No, I mean we're not even friends. I swear... we're not. Dan: You ever hung out with someone but not been able to tell anyone? Rufus: You mean, ah, hang out, hang out or, you know... "hang out" hang out? Dan: Oh god, this was a bad idea. Rufus: What? That was vague. Rufus: So why did you want to grab coffee with your old man? Dan: Do I need a reason? Rufus: No, but you have one. Dan: I, ah, I need your advice. But I gotta keep the details vague. Rufus: Please, the vaguer the better. It keeps parenting a challenge. Lily: Someone who knows about Ben is trying to send a message. You were able to win over my family and my friends. I just want the same chance. Ben: I'm sorry. I should have given you a heads up. She got here a few days ago. That's why I haven't been able to return your calls. Serena: And here I thought I was being paranoid.